The Oakmont Country Club, site of this year’s United States Open, has a long and colorful history. It was designed and built in 1903 by a Pittsburgh industrialist, Henry Clay Fownes. But Fownes, apparently anticipating longer balls and better clubs, laid out an extremely difficult, bunker-laden course. Henry, known as “H.C.” and his son William Clark Fownes, Jr., named for his uncle and known as “W.C.”, who together managed the course,were determined to make even the best golfers work hard to make pars, let alone birdies. Two tales, one apocryphal and the other true, illustrate the role the W.C. played in keeping Oakmont on the edge. The two stories also mark two different time periods, the first in 1915 when poetry was often used to poke fun at something or somebody; the second in 1945, when a poetic opportunity was missed for lack of a verse writer. As the Midiron marches on. “Teacher: Willie Costin (another member), have you any criticism to make of the Oakmont Country Club? So W.C.’s reputation as a bunker builder was well established in the Club’s early years. Fast forward to 1945 when Oakmont hosted a World War II Bond exhibition match. In a practice round, Sam Snead, one of the star attractions, discovered an alternate route to No. 7 and hit his tee shot to the right. He ended up making a birdie. The next day, satisfied with his ploy, he hit the same drive again and much to his surprise found his ball in a brand-new bunker. He made a bogey. It turned out that the superintendent had called W.C. and W.C. had ordered a new bunker to be built before daybreak. A great story, just waiting for a poet’s touch. It’s now 71 years later, but I can’t resist a try at filling in that blank. Instead a drive to the right. This blog began in 2008. Since then I have published more than 170 Posts. In addition, I have published two books of golf poetry. 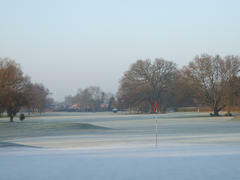 The blog has been visited by golfers from more than 125 countries! Needless to say, I am appreciative of this response to my efforts to reintroduce poetry as part of today’s golf readings. But at the same time I understand that those of you who visit this blog have limited time to spend here. Thus my assumption that many of the poems, particularly the early ones, deserve a second chance to be read. The one below was originally published on this blog in 2009. It was first published about 100 years ago. “Retrospection” was written by W. Hastings Webling (1866 – 1946? ), a Canadian writer and poet, and appeared in the magazine Golf in January 1915. Though he was only looking back to the last golf season, the sentiments he expresses still ring true. Also remember that he was writing at a time when match play was preeminent. I hope you will enjoy reading the poem even though it’s long. But if you fear a long poem as much as a short putt, at least read the first, second to last and last stanzas. Have slowly disappeared from view. And play in balmy atmosphere. Our fond desire for future luck. More than I would like to own. And swift my “birdie” flies away. Are apt to give us one guess more. And in its great uncertainty. And vict’rys charm forever shed. After reading this poem, ask yourself how it compares to reading any article in any recent golf magazine. In my view, today’s golf magazine articles don’t relate golfers to the essence of the game nearly as well as poetry like this does. Let me know what your think if you care to. In life and gowf each roun’. In life and golf each round. “Ring out the Old, Ring in the New!” seems to be a singularly appropriate sentiment this particular New Year time. We have a long and heavy score to wipe off in South Africa before we can settle down in peace and comfort of mind to our ordinary avocations. I wonder what the magazine editors wrote at the beginning of 1914. In any case, I wish you and all the readers of this Blog a happy and peaceful New Year. Is where you should aim. In a number of previous Posts I have suggested that you will have more fun with these poems by reciting them. With that in mind I am starting something new with this Post. If you click below, you can hear me recite this poem! If you have a moment let me know what you think. A lot has been written about the new Master’s champion, Bubba Watson, since he put on his first green jacket. But unlike, a hundred years ago, it’s all prose and no poetry. So I’ve turned back the clock with a few verses to celebrate his well deserved and colorful victory. To the top, more than one trail. They’ve got to go longer because it’s pink. Every putt…were it too pink! April is Poetry Month, so why not a Post focusing of some of what I’ve learned about golf poetry. In doing research for my book, Golf Course of Rhymes – Links between Golf and Poetry Through the Ages, I found that the earliest poem known to include a reference to golf was called “The Muses Threnodie” by Henry Adamson, published in Edinburgh in 1638. Some have argued that Shakespeare preceded Adamson. For example, here is King Lear on pressing: “Striving to better, oft we mar what’s well.” But, I think we’ll stick with Adamson. The complete poem is included in my book. I found it in a wonderful reference book on early golf history called A Swing Through Time by Olive M. Geddes, a Senior Curator in the National Library of Scotland. The “triumvirate” of early golf poems is completed with “The Goff,” a 358-line mock-heroic poem written by an Thomas Mathison and published in book form first in Edinburgh in 1743. The Goff is thought to be the first book entirely devoted to golf. As it were, by enchantment, transferr’d to thy Links. 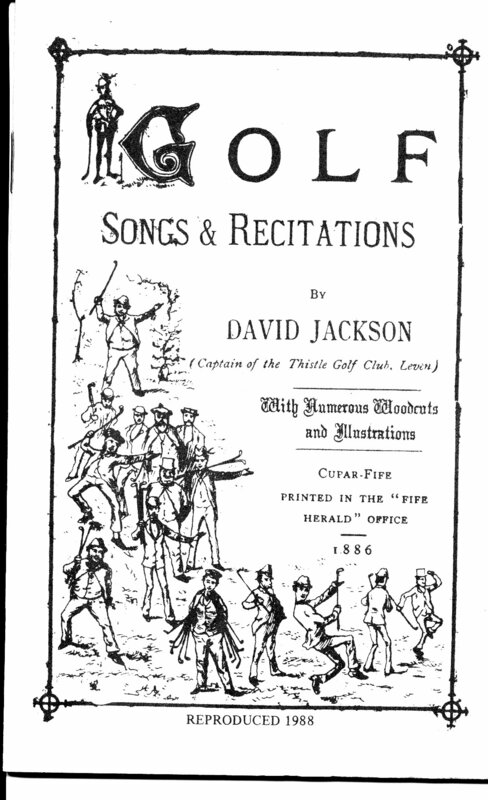 In 1886, David Jackson, Captain of the Thistle Golf Club, Scotland, published a 32 page pamphlet/book called Golf – Songs & Recitations. You can search this Blog for three Posts that include poems that Jackson wrote. A few years earlier in 1873, Thomas Marsh, described as the poet-laureate of the Royal Blackheath Golf Club in London, privately published a small book called Blackheath Golfing Lays. A rare 1st edition copy recently sold for $8400. And Life is wholly good enough for Me. Other British golfer-poets of Risk’s time included Sir Arthur Conan Doyle, Rudyard Kipling (born in India), Andrew Lang, better known for his children’s fairy tale books, Robert H. K. Browning (not that Browning) and John Thomson who wrote a wonderful short book called A Golfing Idyll under the pseudonym “Violet Flint.” The book, subtitled The Skipper’s Round with the Deil (Devil) On the Links of St. Andrews, was first published privately in 1892. In my research I discovered one golf poet of the time, Harry Vardon, who may have borrowed the verse he offered to an auction during World War One. This story can be found in an earlier Post and also in my book. Will let it hang when he starts home. Is no companion for a wife. Other American golfer-poets, contemporaries of Rice, include Charles “Chick” Evans, Jr., the great amateur player, Tom Bendelow, an important early American golf architect, who wrote a parody of “Casey at the Bat” called “Hoo Andra Foozled Oot,” Ring Lardner, one of American’s best short story writers, the Chicago Tribune columnist Bert Leston Taylor, and a New York lawyer, Norman Levy. I also discovered three Canadian poets: Edward Atherton, who wrote a song called “Far and Sure” in 1901; W. Hastings Webling; and a Montreal judge, writer and poet, Robert Stanley Weir, who was most famous for writing in 1908 the first English lyrics to O Canada, Canada’s national anthem. If you know of any golf poetry by poets from other countries, for example, Ireland, India or France, please leave a comment with the reference or poem. And to read poems by most of the poets mentioned above, please consult my book. Note: Part 2, focuses on the question: who reads golf poetry? Filed Under: Australia, golf, Golf Course of Rhymes, golf history, golf humor, Golf magazines, golf poetry, golf poetry books, golf songs, humor, poetry, Scotland, sports poetry, The book "Golf Course of Rhymes" Tagged With: Australia, golf, Golf Course of Rhymes, golf history, golf humor, Golf magazines, golf poetry, golf poetry books, poetry, rhymes, Scotland, sports poetry, The book "Golf Course of Rhymes"
“The Haskellisation of Golf” is the title of an article by the famous English amateur golfer and writer, Horace G. Hutchinson, that appeared in the October 17, 1902 issue of Golf Illustrated, a weekly golf magazine. Hutchinson discusses the question of whether the gutty ball should be replaced by the recently invented Haskell ball. For background see a previous Blog entry, Haskell on the Brain, https://golfpoet.com/2010/07/05/haskell-on-the-brain/. At the same time, Hutchinson wrote his piece, a poet with the initials F.J.K. wrote a poem to the editor (they did such things 100 or so years ago) in which he versified on the pros and cons of switching to the new balls. A Kempshall or a Haskell? Of Braid, or Herd, or Sayers? By those who’ve given it trial. And draw his own conclusion. He’ll pay an English shilling! Of course, issues surrounding the capabilities of golf balls continue. Recently John Solheim, Chairman and CEO of Ping, suggested that instead of a single Ball Distance Rating (BDR) limit (how far a ball can go) there should be three. In addition to the current BDR, there would one shorter and one longer. (See Golf Digest article) Then we would have to endure ads for the longest short ball, the longest long ball, etc. I’d rather go back to the Haskell! New Years 1900 for the English was not all happiness. The second Boar War was under way between the British Empire and the two independent Boer republics, the Orange Free State and the Transvaal Republic. The war did not end until 1902 when the Boer republics became British colonies. These colonies later became part of the Union of South Africa. Golf Illustrated, a new English golf weekly, greeted 1900 by beginning its January 5th edition with a poem and a few hopeful and sober remarks. Another round in the great game of life has now commenced. Let us hope that 1900 will have fewer bunkers in store for us than 1899. We have made the mistake, as common in Golf as in life, of under-estimating our adversary, who, instead of being a third-rate performer, has turned out to be a veritable Colonel Bogey. The game, however is yet young. We have now fairly got the measure of our man, and a few more holes will put a very different complexion on affairs. By the time the Championships are here, there ought to be some golfers in Pretoria. A golf related footnote to the war: Freddie Tait, a highly regarded amateur, winner of the Amateur Championship in 1896 and 1898, fighting as a member of the second battalion of the Black Watch, died in battle on February 7, 1900. To honor his memory, The Freddie Tait Cup is awarded annually to the leading amateur in the South African Open.